Product Description: Walter P. Chrysler was a man who loved machines, an accomplished mechanic who also had highly developed managerial skills derived from half a lifetime on the railroads, and whose success came from his deep understanding of engineering and his total commitment to the quality of his vehicles. 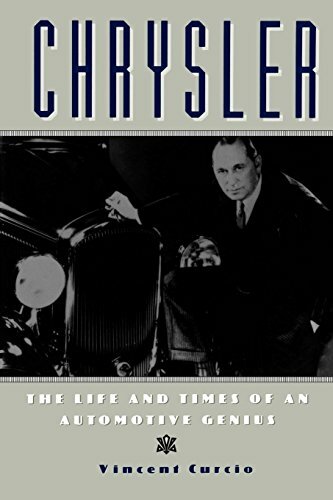 Here, Vincent Curcio presents a richly detailed account of one of the most important men in American automotive history, based on full access to both Chrysler Corporation and Chrysler family historical records. Curcio traces Chrysler's rise from a locomotive wiper in a Kansas roundhouse to his rescue of the Maxwell-Chalmers car company, which led to the successful development of the 1924 Chrysler--the world's first modern car--and the formation of Chrysler Corporation in 1925. Chrysler was quite different from the other auto giants--a colorful and expansive man deeply involved in the design of his cars, he established his headquarters in New York City and built the world's most famous art deco structure, the fabled Chrysler Building. Because of his emphasis on quality at popular prices, the company weathered the Great Depression with flying colors and remained profitable right up to Chrysler's death in 1940.